If you are looking for softer and better quality mink blanket, please visit the Wonu or Solaron sections. 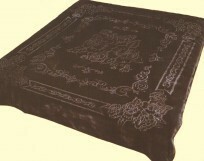 Wonu and Solaron luxury mink blankets are regarded as the best mink blankets in the United States. Be sure to check out one of South Korea newest and finest brands in Wonu Trix, which is softer and heavier than Solaron, and it is easily surpasses Solaron in terms of durability, weight, and softness. These heavyweight mink blankets that are available from Wonu and Solaron are simply the best.